Sunday, July 21, 1912: Went to Sunday School this morning. Had to go through the mud coming homeward. Hence it rained today. Went over to see Miss Caroline May, though it rained, for it won’t hurt me. Farmers worry about the weather–too much rain (not good) . . . too little rain (not good). This year so many farmers are worried about a drought and the possible failure of their corn crop. Did Grandma’s father have similar worries a hundred years ago? 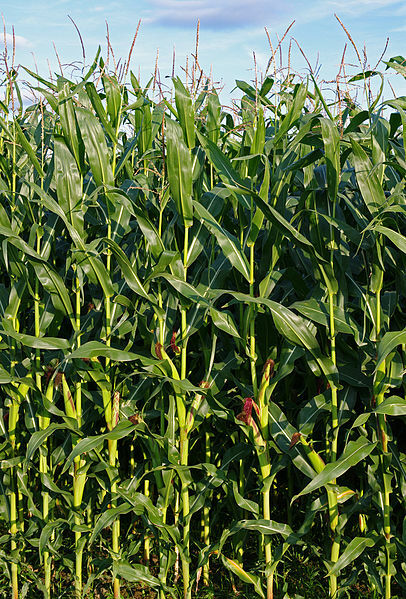 To get lots of corn in the fall it is vital that the corn plants get enough water in July when the corn is tasseling, and the ears are beginning to form. Miss Caroline refers to Grandma’s friend Carrie Stout. Carrie lived on a nearby farm. Posted on July 21, 2012 June 21, 2016 by SherylPosted in OtherTagged diary, family history, genealogy, hundred years ago. RAIN…that welcomed or unwelcomed sight. A former Nebraska farm girl and now at the age of 89, my mother-in-law still talks more about the weather and the corn crop than anything else. Your post reminds me of my teenage summers spent detassling corn–it was so hot out there – but made a lot of good summer friends. I had never heard of detasseling so I Googled it and learned all about it. And I would never have known this if not for you! Glad to see your grandmother was so stoic about the rain and mud. I guess she was going to get out of the house for a bit no matter what the weather! Now to go see what detasseling is. My uncle used to say “knee high by the 4th of July” which my Michigan grarden corn never was. He said it only counted for field corn but I used to get my children or grandchildren to stand out there with their short selves and get photos of my very short corn reaching their knees.